The German made Aviators (Flieger) regular straps & the new tropic style with water - protection rubber sheet with Gore-Tex between the leather and rubber. Made for Military and pilots watches from all decades, with their vintage look they will make a great addition to any pilot or military watch. The standard style is made of 2 sheets high quality real soft saddle leather and one sheet of special anti - stretch material between the leather. Loc Tide 243 to secure the screws. The straps are available only with a solid ss buckle Made in Germany. Comes well packed in an airmail bubble envelope. Choose from the regular style or the tropic style with genuine black rubber and Gore-Tex inside when you live in hot climate countries. Our export prices for the regular style are. 91. - $ US $ for one 24 mm strap. 132. - $ US $ for one 24/22 mm / with oval holes fits on the 22 mm ss buckle from Panerai. Our export prices for the tropic style are. 103. - $ US $ for one 24 mm strap. 145. - $ US $ for one 24/22 mm / with oval holes fits on the 22 mm ss buckle from Panerai. Shipping to the states for one strap is 12, 50 $ US , by registered airmail . For single made custom sizes ( XS , XL , XXL or XXXL ) other buckle end sizes then the series please add about 60.- US $ for one strap for the single factory order. Manufacturing Needs about 30 days for these special sizes. Other custom work is possible but needs an offer. Please notice: No exchange for custom made straps! Swift, bank cashiers check, int. money order, postal money or cash, in registered airmail letter only please. If you don't find your measurements here please ask for your personal custom made strap, I am able to make each you need. 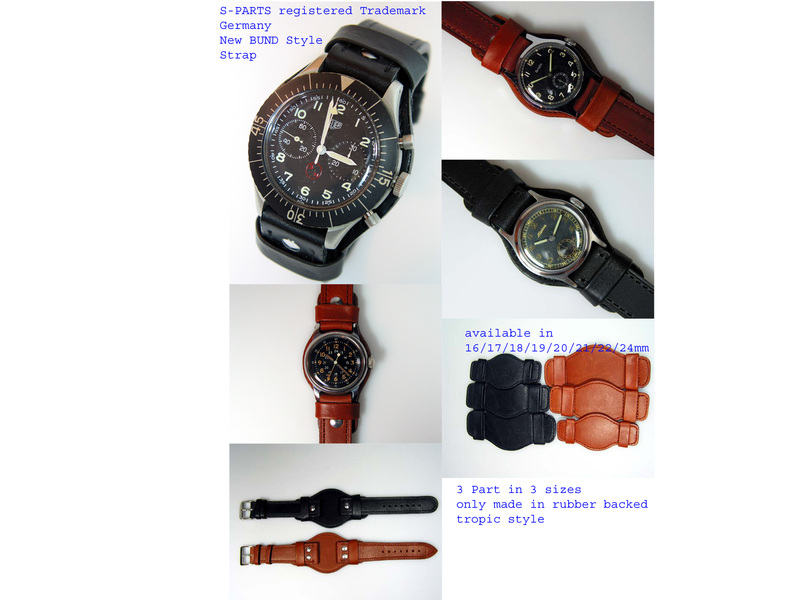 We offer a wide range of watch straps, bracelets, buckles , deployant clasps, watchmaker tools and Swiss Brand items around watches, please feel free and check out at Jurgens Germany. Please ask for my feedback.